Since the main purpose of this website is to offer an easy and straightforward way of visualizing the available products of the Garden Flowers for Everyone shop, the owners have created this special page which is dedicated entirely at presenting their portfolio of garden flowers in a well-designed image gallery which they hope will offer a good overview for all those who are passionate about the subject. Similar to the page where the current offer plants are classified, this page will enable people to preview the different species sorted alphabetically or using other user-defined criteria which will be detailed. The criteria which are available for sorting the plant gallery are the taxonomic ranking (order, family, genera, species), corolla/petals/sepals symmetry and ecological requirements (temperature range, humidity range, light intensity, etc.). Depending on the inputted criteria, users will be met with different results, which will best reflect the plants whose characteristics meet those specific criteria. By using the powerful search feature provided, people can considerably improve the search times, and save precious time instead of manually browsing through the different albums and individual images of the gallery. Since the image gallery was designed with plant taxonomy in mind, the images are also as representative as possible for the different plants and do not have an artistic note to them; quite the contrary, a scientific approach is presented through each image, which contains a watermark that serves two purposes. It copyrights the images as belonging to Garden Flowers for Everyone and also offers some of the main characteristics that offer an easy identification in a taxonomic system: genus, species, inflorescence symmetry and ecological requirements. 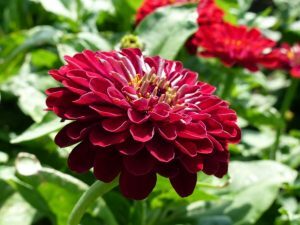 The owners of Garden Flowers for Everyone hopes that everyone will have a great time when browsing the flower image gallery and that people will be able to easily identify the species that they are looking for.